Earth Day 2018 at Metropolitan Touring: What is it and what are we doing for it? What is Earth Day 2018? How is Metropolitan Touring taking it into account when it comes to the environmental impact of tourism in Galapagos? Tourism has often been called “an industry without chimneys,” but it’s important to be aware that tourism operations do, in fact, leave a footprint. What’s more? That invisible footprint, which is often masked by the nature of our leisurely and exploratory activities, can often cause significant damage to the Earth’s natural resources. Oh, and did we mention that that same footprint is never a “light” footprint? The only way to gradually steer ourselves in the right direction is by having all industry stakeholders understand the general and specific roles that we, as humans, all occupy. Fostering this greater level of awareness not only helps us realize just how substantial of a footprint we leave, but also helps us come to terms with what we can do about it, realistically. The solutions to our problems are never as simple to piece together as we’d like to imagine, for our planet is not a jigsaw puzzle where all the pieces fit easily into one another. This is not about who wins, for we will all lose if nothing is done to help the delicate state of our world. The Galapagos Islands are no exception to this dynamic. As a UNESCO World Heritage Site, it is a place where development, conservation and tourism must all coexist. This is why, back in April 22, 1970, a large group of US citizens decided to get together and protest for the environmental rights that our planet deserves. This is how Earth Day was conceived, and not long after this official start, the EPA (Environmental Protection Agency) was established. It was far from being a political move; rather, it was a nurturing way of incorporating scientific facts into the political agenda. Ever since Earth Day was founded, it has served as a means of showing, amassing, teaching and vocalizing the world’s increasing concerns on all matters environmental. It is not a subject to be taken lightly since it concerns each and every inhabitant of this beautiful “pale blue dot suspended on a sunbeam,” as Carl Sagan once wisely said. This 22nd of April, the world celebrates Earth Day’s 48th Anniversary, and we’d like to take this opportunity to reflect on the importance of preserving this planet for all future generations to come. To get fully inspired behind the meaning of this year’s message, let’s wind the clock back and learn a little more about the founding of Earth Day. It was on April 22nd, 1970, that 20 million United States citizens took to their streets and parks to voice their concerns about environmental issues. It had been an extremely volatile year, filled with somber news that ranged from the death of rock idol Jimmy Hendrix to the tragic losses that were the result of U.S. war against Vietnam. The country’s youth by this point had had enough. Inspired by the anti-war movement and the growing feeling of helplessness in the face of the Santa Barbara oil spill, Senator Gaylord Nelson from Wisconsin rose to the occasion. He saw the need to raise awareness about air and water pollution and asked for the support of Republican Congressman Pete McCloskey and Harvard professor Denis Hayes. Their initial efforts eventually evolved into what we now know as Earth Day, which eventually came to be officially recognized worldwide in 1990. The Earth Day Network has achieved the monumental task of disseminating the philosophy behind this movement and sharing it with an impressive number of countries. The date is no longer just a part of a local movement, rather it has become an international platform for awareness and change. What is this year’s message or “Earth Theme”? Every year, a new “Earth Theme” is selected as the core message for the commemoration of Earth Day. This year’s Earth Day 2018 campaign is: End Plastic Pollution. From poisoning and injuring marine life to disrupting human hormones, from littering our beaches and landscapes to clogging up our garbage bins and landfills, the exponential growth of plastics is now threatening the survival of our planet. As a company, we always make sure that we “walk the talk.” That’s why, even before anyone was really talking about all this, Metropolitan Touring made a substantial effort to get involved with the community and local municipality of Santa Cruz Island (over in Galapagos) and spearheaded the management of solid waste. Years later, we can now clearly see the fruits of our labor: a community that once had no real waste management now completely understands what an environmental footprint is and how to manage it properly. Metropolitan Touring has a unique appreciation for the importance of Earth Day, thanks in large part to its dedication to working in iconic and privileged locations such as the Galapagos Islands and the Mashpi Reserve. The former has long been considered a living laboratory of evolution and numerous scientific areas, while the latter takes the cake for being 1 of the 16 biggest hotspots for biodiversity on Earth (with new species are still being discovered to this day!). We have dedicated decades to working with our guests, local communities, scientists, government and more to preserve what we love and what we hope to continue to share with future generations. This is our conviction and our commitment. Our specific efforts, all connected to Earth Day’s main theme, have allowed us to reduce the use of plastics. This is why disposable plastic water bottles have been eliminated from all of our vessels and hotels. Instead, we provide our guests with a complimentary, stainless-steel and re-usable water bottle. And, in case you’re wondering, here are the numbers: this very simple practice has allowed us to eliminate the added burden of importing and discarding nearly 12,000 disposable plastic bottles per year! This all adds up to help diminish our environmental impact by around 150 kg (330 lb)! That’s a ton of less stress on our landfills and recycling facilities! Keep in mind that only about 10% of the world’s water bottles are actually recycled. So, if you think recycling is the only solution, well think again. Although this may seem like a modest effort, it’s certainly one of our many contributions in lowering our footprint. Quite naturally, this example is a very tangible one, but we must think of the intangible impact that it has, too. Such impact, though, is a really crucial one because it has to do with the survival of our own planet, and it’s called climate change. When was the last time you confronted the issue of your CO2 emissions (carbon dioxide emissions) as a result of your productive day-to-day activities? Think about it. All economic and operational activities create a number of emissions that are labeled as CO2 emissions. This gas is considered to be one of the largest contributors to GHG (greenhouse gases), and the result of burning fossil fuels. Emissions can be measured and this is how we understand our carbon footprint. Some also call this their ecological footprint. 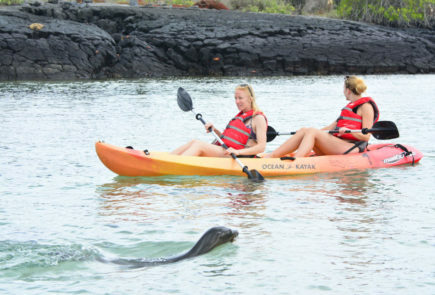 How big of an environmental footprint does tourism in Galapagos make? To put it into perspective, our research shows that each of our guests in Galapagos and Ecuador, during their stay with us, releases approximately 2 tons of CO2 into the atmosphere (this includes transportation logistics, services, amenities, food, supplies, etc). So, the question remains: how responsible do we need to be in order to minimize the impact of climate change throughout our planet, due to the effect of greenhouse-gas emissions? Who is addressing this agenda? Who is the driver of change? Every single one of us is. And every single effort counts, so if you’re doing something about it, that’s fantastic. But if you aren’t yet, then we hope that this blog serves as an invitation to join us in our efforts! Explore the Galapagos in sustainable fashion with us today! Credit Images: EarthDay Network, Fefco Sustainability, Going Green Linfield. Top 5 Galapagos Last-minute Red Flags (and how to avoid them)!